LONDON, April 20, 2013 (AFP) – Former England captain Mike Denness died aged 72 after a long battle with cancer. Denness was the only Scotsman ever to captain England, leading the team in 19 of his 28 Tests between 1969 and 1975. He also played 12 one-day internationals and went onto become an ICC match referee. Denness was awarded an OBE in this year’s New Years Honours for services to sport. His reign as England captain was marred by a strained relationship with Geoff Boycott, then one of the team’s star performers. But he returned to hit 188 in the Melbourne Test which, at the time, was the highest score by an England captain in Australia. 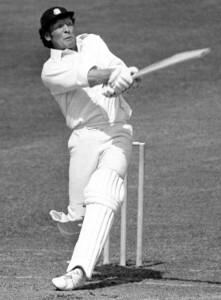 Denness played county cricket for Kent and Essex, scoring more than 25,000 runs in his first-class career and captaining Kent to six domestic trophies between 1972 and 1976. During his time as an ICC match referee his controversial decision to sanction six Indian players in Port Elizabeth during the 2001/2002 tour prompted the Indian and South African boards to ban Denness from officiating in the next match. The ICC responded by withdrawing Test status from the game. Denness’s death prompted numerous tributes from within the sport. Michael Vaughan, who was England captain for the Ashes series win over Australia in 2005, wrote on Twitter that he was a “classy batsman and a lovely chap”. Kent chairman George Kennedy said: “This is an extremely sad day for the club. We have lost one of our great players, a very successful captain and a good friend. England and Wales Cricket Board chief executive David Collier saluted the long-serving Denness for his contributions to the game from player to administrator. “Mike was a man who gave so much to our game in so many different ways as a player, captain, match referee and administrator,” he said. “I had the honour of working with Mike in my first role in cricket administration at Essex and Mike was a wonderful source of advice and knowledge. He will be sorely missed by all, especially by everyone at Kent.